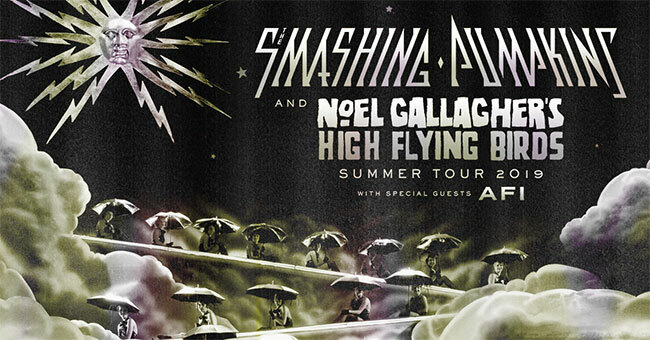 The Smashing Pumpkins and Noel Gallagher’s High Flying Birds have announced they will be hitting the road together for an incredible, can’t miss summer tour. AFI will join as special guest on all dates. The special run of dates will see both artists performing outdoor shows at amphitheaters across North America throughout the month of August. The outing will also include an epic stop at the Banc of California Stadium in Los Angeles, CA, more information on that show to be announced soon. Produced by Live Nation, the 16 city trek will kick off August 8th in Camden, NJ at BB&T Pavilion and make stops in Toronto, Chicago, Dallas, and more before wrapping August 31st in Mountain View, CA at Shoreline Amphitheatre. Tickets go on sale to the general public beginning Friday, March 8th at 10 am local time at LiveNation.com. * Citi is the official pre-sale credit card for the tour. As such, Citi cardmembers will have access to purchase pre-sale tickets beginning Tuesday, March 5th at 10 am local time until Thursday, March 7th at 10 pm local time through Citi’s Private Pass program. Formed in Chicago, IL in 1988, The Smashing Pumpkins released their heralded debut album Gish in 1991 and found mainstream success with 1993’s 4x multi-platinum Siamese Dream and 1995’s 10x multi-platinum Mellon Collie and the Infinite Sadness. With over 30 million albums sold to date, the two-time GRAMMY, MTV VMA, and American Music Award winning band remains one of the most influential alternative rock bands in the world. Noel Gallagher has been one of the UK’s most loved and successful songwriters for over a quarter of a century. His latest album, Who Built the Moon? debuted at No. 1 in the UK and was certified gold in less than two weeks of it’s release and marked his tenth consecutive chart-topping studio album in the UK — a feat no other artist has ever achieved. After leaving Oasis, Noel successfully launched his solo career as Noel Gallagher’s High Flying Birds with a self-titled album in 2011 which sold 2.5 million albums worldwide. Noel is the former lead guitarist and principal songwriter of Oasis, the 3X GRAMMY nominated UK rock band. Oasis quickly became one of the biggest bands in the world in the 90s, selling over 70 million albums worldwide to date, but, more than that, their music became the soundtrack of a generation.